Hello Everyone! I trust your week is coming along. Know you’ve been in my thoughts and prayers. 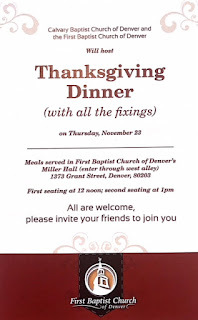 A week from today FBCD will be hosting with Calvary Baptist Church of Denver dinner for Thanksgiving. Here's the flier we’re using to advertise this event (note: we’ll have two sittings). Please help us pass the word. We anticipate many of our guests coming from the downtown area and folk who probably are not living with a roof over their heads. We will celebrate together with a partner congregation to do together what none of us could do on our own! I hope to see you this Sunday. 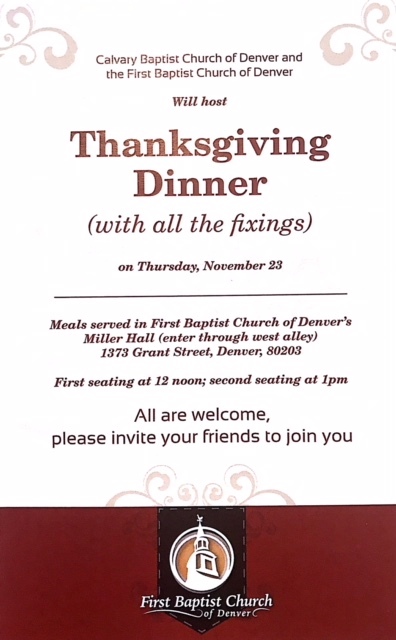 Invite someone to join us for service. They’ll be glad you did! 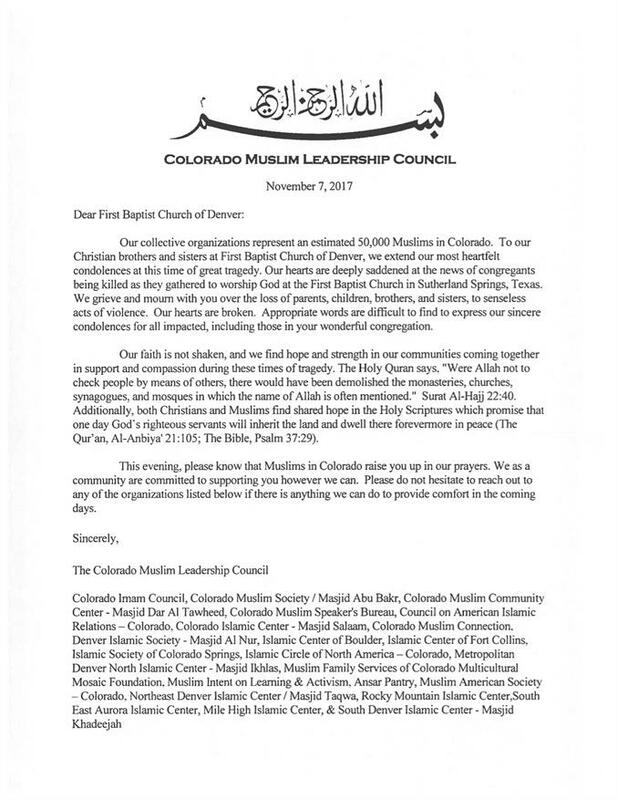 This past Tuesday evening representatives of the Colorado Muslim community visited FBCD to express their support and solidarity in response to the massacre that happened at the First Baptist Church of Sutherland Springs, TX, last Sunday. 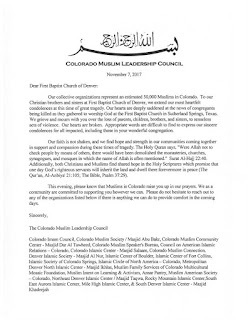 Those present shared with about 25 FBCD members and friends a letter that was signed by more than a dozen different Muslim organizations. In return, on behalf of our community, I shared a letter of appreciation with our Muslim sisters and brothers. Following this exchange of letters, we spent time as a group in conversation with each other. 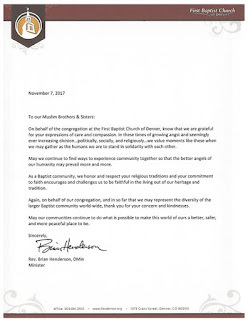 The Muslim community extended to FBCD a formal invitation to experience a service and meal at one of their local mosques. We will make plans for this to take place soon. Please plan to be present for this Sunday’s 10:30 service. As always, invite someone to join you. They’ll be glad you did! Dear FBCD Family & Friends! Don’t forget! This weekend we get an extra hour of sleep. I hope you plan to be present for service at 10:30 as it will be a special morning. We will be recognizing All Saints’ Sunday and honoring those within or related to our congregation who have died over the past two years; we will celebrate communion using some of the original 1864 communion ware; and we will be graced with special music and musicians that is sure to move our spirits. Additionally, on Sunday morning we will continue at 9am in the Fireside Room our scripture series, “Acting Out: A Study through the Book of Acts.” Each week we read a chapter, review social-cultural notes, and then engage questions for discussion. If you haven’t checked this out yet, join us! You’ll be glad you did. Finally, looking ahead to next week, members and friends of FBCD will receive our annual pledge request letter. This request helps our Church Council plan for the next budget year. Be looking for this and please be consider how your time, talent, and treasure can continue to support the vital ministry that happens at 1373 Grant Street. Thank you for the opportunity to serve as your pastor. It is an honor to be learning from you and serving alongside of you in many ways.